I have decided that watching every Elvis movie is a good idea. There are 31 movies – all musicals – in total. This project will likely drive me insane. I was initially concerned about Loving You. The only copy of the movie I could find was on YouTube (with an added bonus of Spanish subtitles) and that was looking like my only (terrible) option. (Of course. I have never watched a movie that has been broken up into 12 parts on YouTube.) Fortunately, I prevailed and watched Elvis Presley’s second film. Please feel free to thank me at the end of this post.Loving You picks up where Love Me Tender leaves off. The Reconstruction Era! Okay, not really. 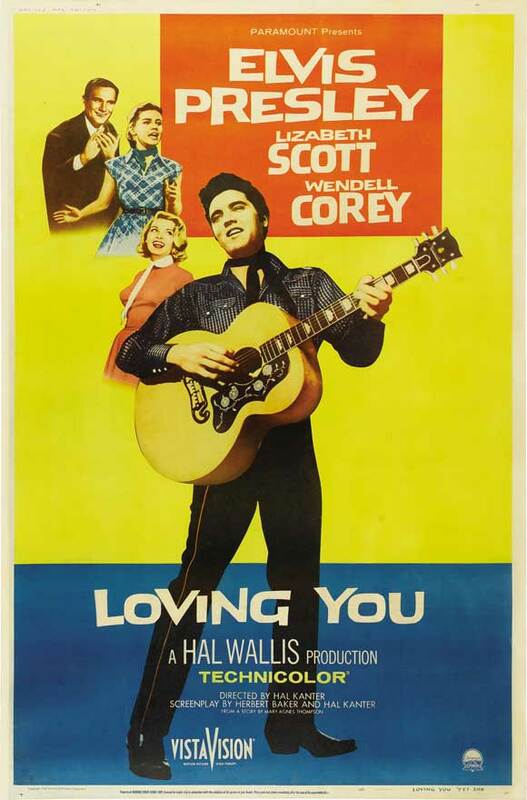 Loving You is Presley’s first technicolor film and his first receiving top billing. 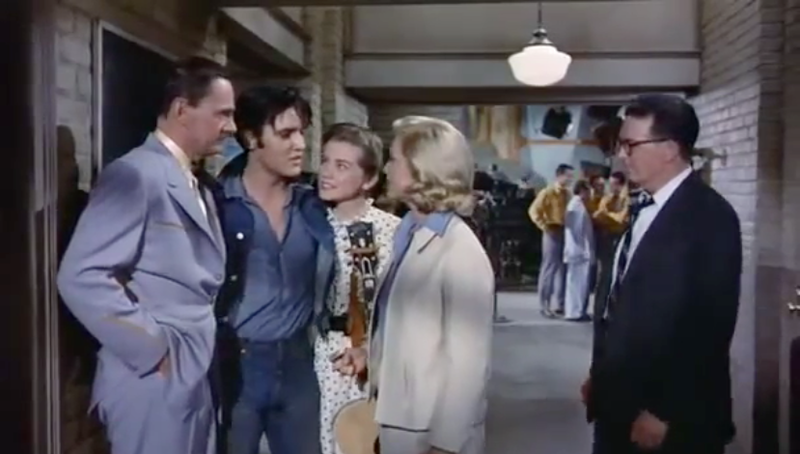 Elvis plays Deke Rivers, a small town delivery man who is plucked from obscurity and becomes an up-and-coming musician thanks to publicist Glenda Markle (Lizabeth Scott) and country singer Tex Warner (Wendell Corey). Let’s call it A Face In The Crowd lite. Unlike Love Me Tender, Loving You gets right down to business. There are no superfluous plot points. At a political rally, Glenda notices Deke and pressures him to sing on stage with Tex Warner and his band. This first musical number, “Got a Lot o’ Livin’ To Do”, takes place minutes into the movie and lets us know that Elvis Deke is someone we should be paying attention to. What’s great about this performance and most of Loving You is that it perfectly captures what Elvis represented at this stage in his career. He has an undeniable appeal that makes young women go crazy and traditional family men scoff. He represents a change in American music no one anticipated. This “something” is what Glenda notices about the singer. She pushes a reluctant Deke to join Tex’s band. When Deke doesn’t want to give up his steady job as beer delivery man, Glenda tempts him with $50 per week. Deke won’t budge. Elvis, you are so naive. I will make you a star. But the next day Deke conveniently finds himself jobless and he joins the band on tour, something Tex is not initially thrilled about. Deke’s addition to the group brings a necessary change to the tired country act. Soon the band finds themselves with a growing fan base of young women who love throwing themselves at Deke. Clearly this role was a stretch for Elvis. Glenda is a ruthless publicist with quite the raspy voice. (Between Lizabeth Scott sounding like Harvey Fierstein and a fleeting moment where Elvis spoke exactly like Kenneth Parcells, I couldn’t contain my laughter. But I digress.) There is something terribly Oedipal about Glenda’s relationship with Deke. He has no immediate family (“I never knew who my kinfolks were”) and Glenda becomes a maternal figure to him. She expertly crafts his star image, staging photo ops and encouraging fans to brawl with Deke. She doesn’t care who gets left behind as long as Deke Rivers becomes the next big country music star. This means Tex Warner, her ex-husband who she still has a thing with. He’s not hip enough anymore to be famous. There is also this kiss. Deke is obviously uncomfortable with his sudden stardom. When he is at a restaurant one night, his fans ask him to sing. After obliging with a performance of “Mean Woman Blues”, he gets into a fistfight with a fan’s boyfriend. That fan then sneaks into his dressing room and they are photographed together in a compromising position. While Glenda couldn’t have planned this better, Deke is unsure. He wants an escape. As all of this is happening, Deke starts a relationship with Susan Jessup, one of the singers from Tex Warner’s band. (Susan is played by Dolores Hart, who you might know better as the nun who was at the Oscars.) Because of Deke’s growing stardom, Susan is let go from the band. Susan happens to be a girl from a farm. 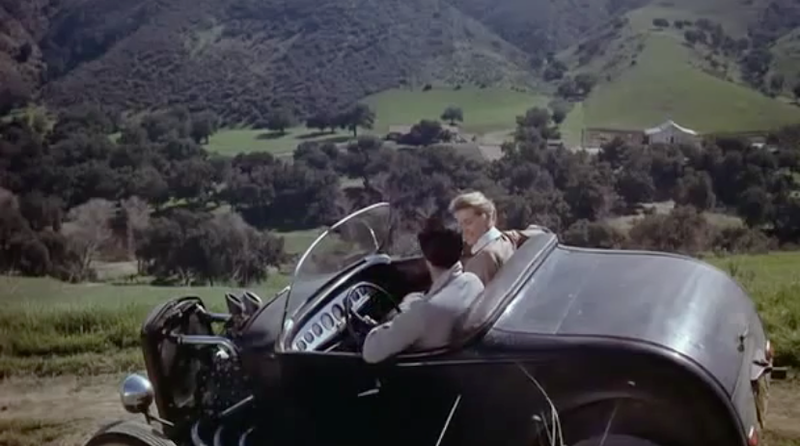 Deke drives her home and spends a few days with Susan, relaxing in the countryside. This is when Elvis performs the film’s title song, “Loving You”. Try not be distracted by the strategically placed cows in the background. They remind us that wholesome American nuclear families living in the countryside is always better fame. But Glenda will not stand for Deke hiding out in the country. She creates an elaborate lie (a rich widow thinks of him as the son she never had and wants to give him a car) to drag Deke back. This is when Deke finally realizes that Glenda has been deliberately manipulative to build his career. In a dramatic scene, Deke decides to show her where he came from and drags her to a cemetery. I briefly thought that Deke was going to kill Glenda, then I remembered that this is an Elvis movie. Whatever is going to happen next is going to be twisted yet still turn out to be sappily wholesome. Deke reveals that 11 years ago, when he had nothing, he found himself in the cemetery. 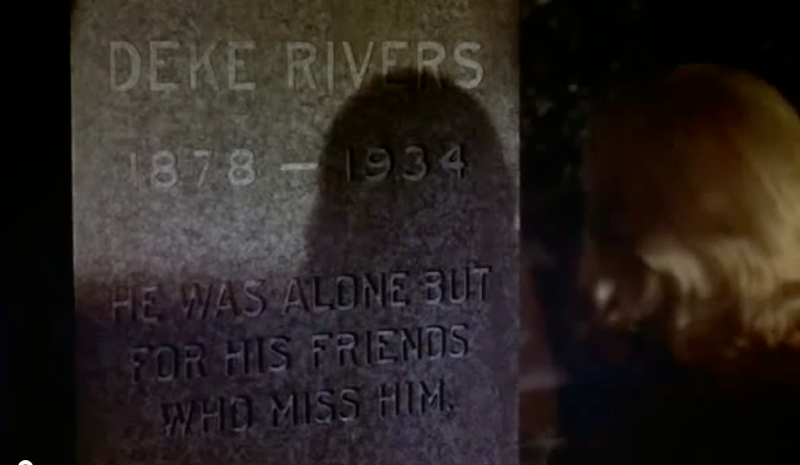 He discovered the grave of a Deke Rivers who died in 1934. “I don’t anything about him more than I do me,” Deke reveals. He assumed dead Deke’s identity in the hopes of making something of himself and finding some friends. Suddenly, Matthew Weiner doesn’t seem so brilliant for creating Don Draper. Glenda is totally fine with the ridiculous backstory case of assumed identity she just stumbled upon. Like this would actually bother her. One day it will sell tabloids. The film’s final moments center on the apparent immortality of rock music. The fan frenzy surrounding Deke caused mothers from one small town to act. They demand that the mayor cancel Deke’s performance to protect their children from rock ‘n’ roll. Glenda passionately tells town officials, “You cannot blame the behavior of young people or old people on music.” So they allow the performance, the local teenagers defend their right to listen to rock music, and so, all is well. The town accepts Deke as a great musician and not a hip-swiveling, immoral idol who hell bent on turning young women into harlots. Deke gets a recording contract, the girl, some friends, and an Oedipus complex. (Look out, Tex.) Everyone wins. Especially dead Deke Rivers. Loving You fully introduces the Elvis stage and screen persona. It sets up (I’m assuming) every movie that follows. 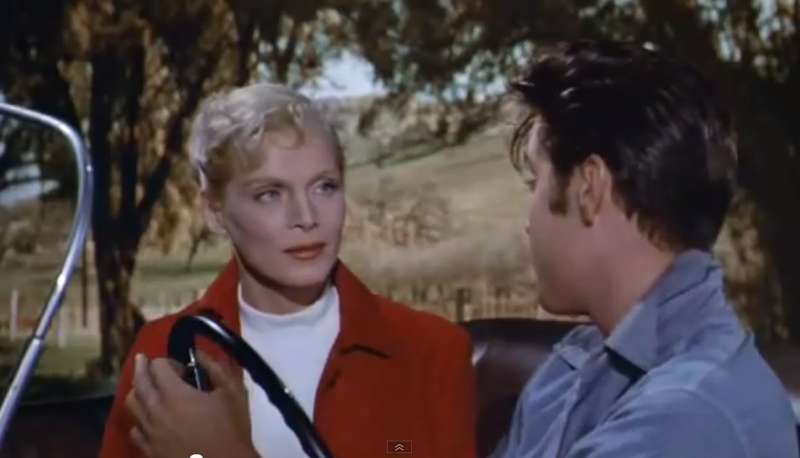 But mostly the film makes a case against the real-life criticism Presley was receiving in the 1950s. Young people and teenagers loved him. How the audiences are depicted as a reacting to Elvis’ performances within the film are exactly how audiences reacted to his actual performances. Older generations found Elvis to be immoral. Loving You makes an argument for why the against Elvis Presley’s music was ridiculous and wouldn’t stand up over time. I now have 29 Elvis movies to watch. Jailhouse Rock is next.